Volunteer Marketing Assistant Fay Hough chats to Associate Director Chris Lawson about his time in rehearsals for The Pitmen Painters. Tell us about what your role in The Pitmen Painters rehearsals. 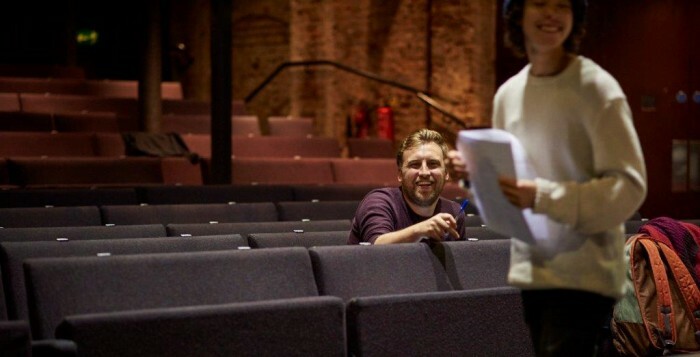 My role is to support Kevin Shaw (the Coliseum’s Artistic Director) and the cast in the creation of the play; it can be as simple as being in the room watching runs and chatting with Kevin about it. An advantage of not being in the room all of the time is that I can come in as a semi-outside eye, and I can see the developments that have been made. I also assist the cast, which can include being in the green room (where the actors relax between rehearsals) or just chatting to them about the play and easing some of the pressure on Kevin. Sometimes it’s about sitting quietly in the corner and being friendly and supportive in the rehearsal, which is easy because the cast are great and it’s a brilliant play. Is this a role you are going to continue doing in future productions? It’s a slow build up. I’m relatively new to the Coliseum so this has been a good opportunity to build up my knowledge and watching Kevin work has been extremely beneficial – although I’ve directed plays I certainly don’t know it all by any stretch of the imagination. It’ll be great to watch the production in tech week (the week when we add lighting, sound and get to work on stage in the rehearsal process) as I’ll see how things come together specifically in this building. This will then move on to me working on Pygmalion in May as the Associate Director with Robin Herford as Director, then my main stage debut will happen in the new season for the autumn. So I’ve put together a three-stage plan, in effect, to ease me in and I am very grateful for the opportunity to do this. Is it interesting to watch the production progress over the rehearsal period? Yes, I attend rehearsals about two or three times a week and I’ve seen different development stages or choices that the actors have made. I’ve also seen how Kevin has moulded the actors and the piece together into what he, and they, all want it to be. Sometimes it’s just the little things – you’ll see something at the start, which will then disappear in the middle and occasionally end up coming back in week three. The script is quite fast-paced with a lot of interjections from characters so it’s been fascinating to watch it being rehearsed from something that’s quite wordy and depends heavily on pace to something that’s now very sharp and snappy. It’s great to see the relationships with the characters and how the actors find those moments. As Associate Director, do you have creative input? Yes, being an Associate or an Assistant, it’s about having a trust, understanding and respect for the Director – which I have in abundance for Kevin. It’s knowing when it’s appropriate to say things and it boils down to when you’re asked for input. Knowing that your input is honest, useful and that you aren’t just saying things for the sake of it, but that it’s contributing and that if there’s nothing to say then that’s fine. Quite often we’ll be agreeing on moments with just a look or a nod and just know that we’re on the same page. Kevin is often in the room on his own and clearly doesn’t need someone else in there but it’s been nice to be there. Is there a camaraderie between the cast and crew? Ninety-percent of directing is casting and quite clearly Kevin is great at casting, that came through straight away in the rehearsal room. People are obviously nervous and anxious about what to expect but very quickly Kevin puts the cast at ease. You can see the cast are comfortable with each other and that there’s a bond and a trust there. What are you learning from watching Kevin direct? The main thing I’ve learnt is that within the time-frame Kevin has he is just consistently effective. He doesn’t do things to placate himself or talk too much, he trusts the actors to do the work and allows them room to bring things to the table and there is the understanding that those offers may or may not be taken forward, which is accepted by everyone in the room. I’ve also learnt that what I’m doing is, in many ways, on the right path and it’s reassuring to see a Director work where we have quite similar thoughts and approaches. You very rarely get to see another Director work and so I had the fear of Kevin being completely different in approach, which would still be a learning curve, but it’s just reassuring that we’re similar, although he’s obviously much more practiced in it than me. It’s outlined that I need to be more streamlined and clear in what I need to do. I still genuinely laugh wholeheartedly at the introduction and the opening two scenes where Robert Lyon walks in to this group not knowing what to expect and how you can see the dynamics of the characters coming across. You can see how this is asking for trouble – this group of characters in an art appreciation class with someone who is, on the surface, very different to them. There’s no way you wouldn’t want to watch the rest of the play after seeing that set up – it hooks you in straight away. And then looking at the end of the piece and seeing the journey. Does this work link with any other projects at the Coliseum? Part of my role as Associate Director is to programme the studio shows and support emerging artists and new work; some of this should be in response to, and complement, the main house shows. One of the ways we’re doing this is by bringing a new play called Coal Girls by a new writer and recent ALRA graduate, Rachel Stockdale to our Studio. It’s a fictional insight into the lives of the wives of the Pitmen and what they would be thinking about their husbands and partners going off to an art appreciation class. I hope the audience of Pitmen will get on board and support the work, it’s a great piece and certainly gives you more insight into what their reactions may have been.